Are we still in Italy? Doesn’t Asia begin as soon as we perceive, at the bottom of Piazza San Marco, still so European with its flawlessly aligned arcades, its Basilica with the same name, the capricious globes of its five irregular cupolas, and then inside when we find, under mysterious vaults, the sparkle of gold and the shimmer of Byzantine mosaics? 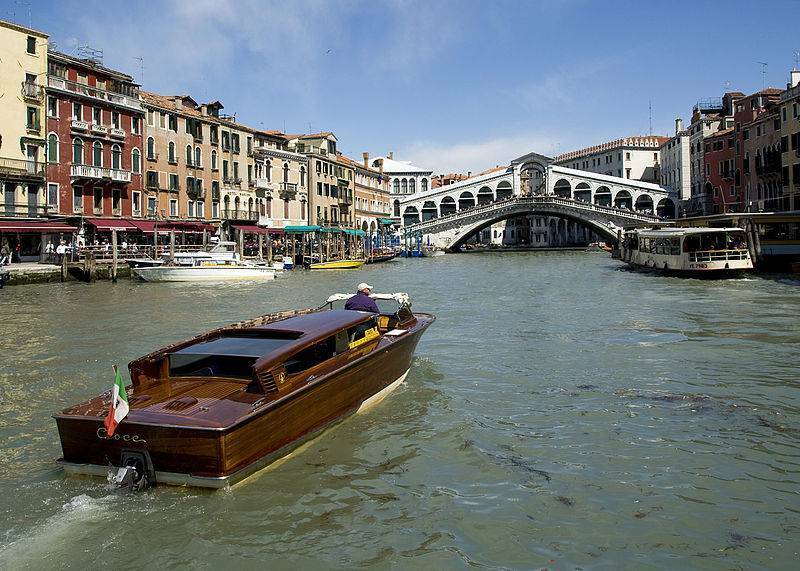 One of the charms of Venice is that it transports us beyond our geographic and mental borders. A place where Rome and Constantinople meet and merge, it extends an enchanted bridge between the West and the East. Everything is unique here, in fact: the delicate architecture that seems to ignore the weight of its materials; the picturesque facades, light as fabric; the improbable maze of the vicoli, so narrow that we graze each others’ shoulders as we pass; the palaces’ mossy thresholds that lead directly onto canals. Furthermore, has anyone ever seen a city built on water, where the transportation routes (canals) are radically different from the walking paths (alleys)? It’s the only city in the world where you can walk without worrying about traffic, where you can wander completely absorbed in daydreaming, where the dream is more powerful than reality. Beyond Melancholy But beware! The worst mistake would be, while looking at these canals straddled by high footbridges, to say, as Paul Morand did in his thoughtful melancholic tone, “The canals of Venice are as black as ink; it’s the ink of Jean-Jacques, of Chateaubriand, of Barres, of Proust.” His Venices is one of the loveliest books the city ever inspired, but this sentence tends to freeze Venice in the image of a dying or dead city devoted to twilit splendor and decadence. Thomas Mann and later Luchino Visconti trumped Barres and Proust with Death in Venice, whose fame helped transform Venice into a sepulchral city. 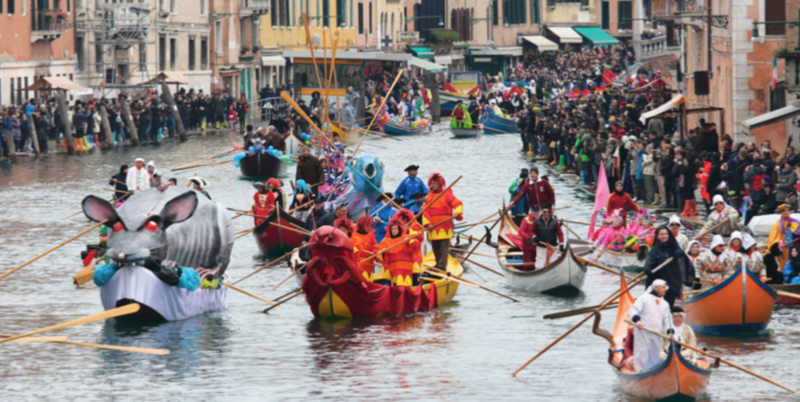 Who will rid us of the clichés that literature and film have attached to Venice? No, Venice isn’t a necropolis haunted by sinister echoes, but an active city, forever young, changing colors with the seasons, gray in the winter mist, salmon in the first days of spring, radiant in summer, and rust- colored in autumn. Forever young To understand how alive the city is, it’s best to visit in the colder months, when the tourists are scarce. There is boundless activity everywhere, an incessant back and forth of footsteps and ships, a quantity of open markets that resound with cries and cheerful calls, a multitude of artisanal shops where the lively murmurs of tanning, binding, shaving, chiseling and pastry-making fill the vicoli. 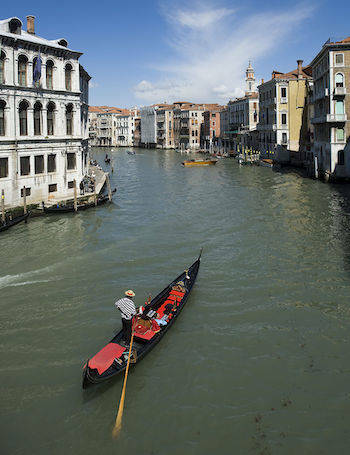 The gondolas with their black funereal elegance are in the minority on the canals; the latter are crisscrossed with transport boats, barges loaded with wood and coal or drifting under the lighter weight of fruit and vegetables, since all business is done on the water. Even in the fog, when the sirens and church bells emit their signals through the thick mist and we hear the pedestrians pounding the pavement before spotting their silhouettes, one is struck by the vitality of these people. Amid such diversity, imagination, the resemblance between dynamic locals and the city’s exuberant facades comes as no surprise. 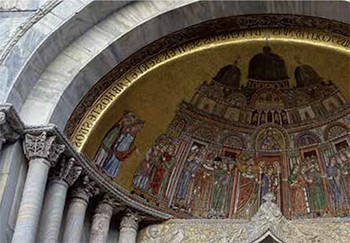 These roseatticed balconies, this festival of Gothic lace, these porphyry and serpentine inlays, the arches, the domes, the arabesques of marble and stone that made Venice glorious aren’t an illusion of folklore: all of this luxurious and inventive architecture is a manifestation of Venetian character. The most famous palace on the Grand Canal is called “Ca ‘d’Oro” (the House of Gold), with its fantastic Gothic polychrome marble given free rein throughout its arcaded galleries and open balconies, and its light fortifications crowning the building help give the appearance of a jewel rather than a house. Capital of Joy If Venice is threatened today, it is not from within. It’s not undermined by the mental sickness to which Thomas Mann’s Gustav Aschenbach succumbs. The danger comes from outside: from the speedboat waves eating away at the houses’ stilts, the giant cruise ships that shamelessly drop anchor in front of the Doge’s Palace and stir their obscene propellers in the canals’ still water, and the onslaugh of tourists on the fragile vicoli pavement. Venetians love life in the same spirit they love beauty. Beauty has always been part of their decor. 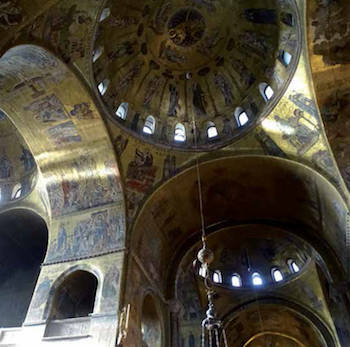 In every church you enter, you see a masterpiece; in each palace a fresco dazzles you. he had to endure, including being imprisoned in Piombi, the famous infernal jail, which he wouldn’t have escaped from without a wholehearted desire to live? Venetians the lot of them, and they were not steeped in the black ink of the canals but in the red blood of jubilation. They would be shocked to hear their city would one day symbolize what perishes, what comes to pass, what dies. “This country, in its current state, is still perhaps the most joyful of Europe,” noted Stendhal in 1815, before the dangers mentioned above cast their shadow on this natural inclination. Carnival, which would last six months, was the popular manifestation of their taste for partying. City of Women Look at Titian’s Venus, the allegory of physical pleasure. Look at Giorgione’s nymph, the glorification of motherhood. Look at Tintoretto’s luscious Suzanne being ogled by old men. Are they not all filled with a powerful potion? In this regard, Venice should be seen as the city of women, just as Florence is seen as the city of men. Donatello, Michelangelo, and Benvenuto Cellini paint or sculpt erect men—and lean men at that. Giovanni Bellini, Giorgione, Titian, Véronèse and Palma the Elder paint women, mostly ones whose opulent flesh finds maximum development in a reclining position. Venus lounging, Danae mute under a golden rain—these are symbolic figures of Venice, just as David is the presiding genius of Florence. Venice is entirely a female city, a town lying down, displayed, full of the shadowy folds of female secrets carpeting the ends of deep alleys. Music City Finally, Venice is a musical city. Everywhere there is the murmur of water, like a continuous bass. Need I remind you that in many of the church paintings that so delight us we see an angel at the Madonna’s feet, playing the violin in glory, like Giovanni Bellini’s winged teenager in San Zaccaria? There is also the fact that the painters themselves willingly played instruments, as evidenced by the large Veronese canvas in the Louvre, The Wedding at Cana, where the quartet has been identified as Titian on bass, Tintoretto on guitar and Veronese himself on the cello. Tiepolo’s angels play the trumpet in heaven and his female characters, the mandolin. 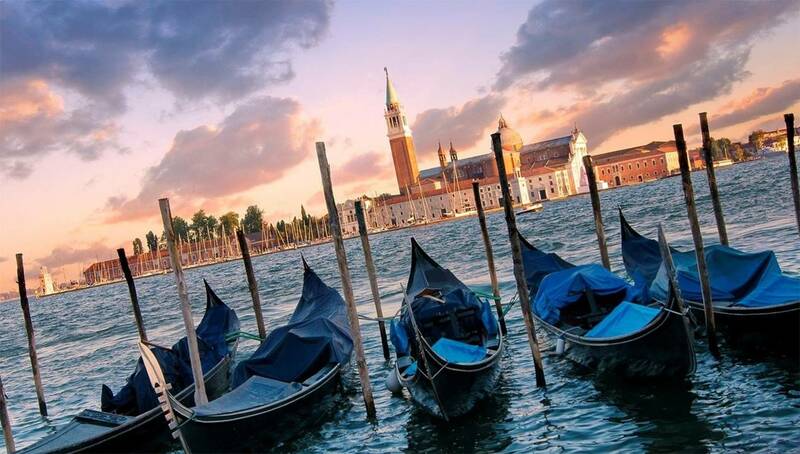 “We sing all over the squares, streets and canals,” wrote Goldoni, and Goethe marveled at hearing the gondoliers setting Tasso’s or Ariosto’s stanzas to music. If songs have replaced high poetry today, it’s still not uncommon for a voice to rise up from a street corner and intone a long melody that floats along on the water. The first public Italian opera was opened in Venice, in 1637, followed by sixteen others until the end of that century. All but one have disappeared, the delicious San Giovanni Crisostomo, renamed Malibran, which continues to host performances. As for the Fenice, one of the most beautiful opera houses in the world, it dates from 1790. 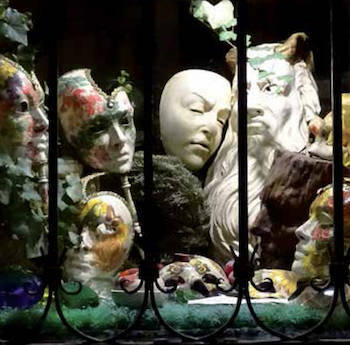 A trip to Venice without an evening at La Fenice would be like visiting Paris without a walk through Montmartre. Rossini chose this theater to create L’Italiana in Algiers, Verdi La Traviata and Rigoletto, and Stravinsky for his only opera, The Rake’s Progress. Stravinsky asked to be buried in Venice, in the ultra poetic San Michele island cemetery next to the Russian ballet master Diaghilev’s grave, who had commissioned Petrushka and The Rite of Spring from him. Vitally Modern Venice is not all about the past. It is not just a maze of ancient streets, not only a bevvy of splendid museums housing classical painting, not just the glory of the Doges epoch; it is also the city in Italy where contemporary art shares the spotlight. The Guggenheim Museum, the François Pinault Foundation at Palazzo Grassi and the Dogana da Mar, and the great masses that come to the Biennale polish the centuries- old patina. 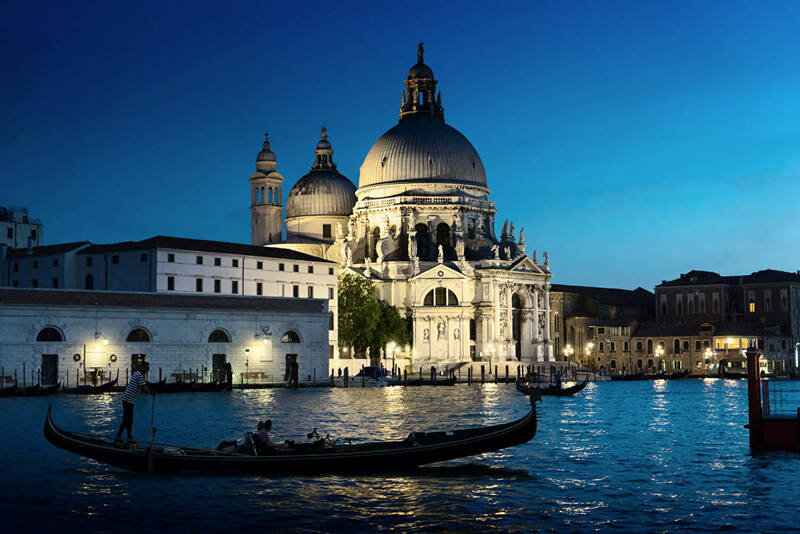 Another witness to the vitality of Venice is the international film festival on the Lido, Mostra, which has unveiled legendary directors like Kurosawa, Bergman, Bresson, Godard, Antonioni, Pasolini, Nanni Moretti and hundreds more. Oh, who could possibly still say it’s only attractive for the images of decay it offers up to melancholic souls? In the waters of the lagoon, we have every right to draw on the happiness that comes with feeling of our time and part of the scene in this constant renewal of energy and artistic creation. *Dominic Fernaned: French writer of novels, essays and travel books. In 1982 he won the Prix Goncourt for his novel about Pier Paolo Pasolini and in 2007 he was elected a member of the Académie française. He taught in Naples at the French Institute, then Italian literature at the University of Haute-Bretagne at Rennes.